I'm taking a short break from blogging this next week. We just found out my dear husband, Hal, has pneumonia. It totally blind sided him ... didn't even have a sniffle before it hit. We went to Urgent Care this am ... they gave him IVs (fluids, antibiotics). Looks like we may have a few doctor visits this coming week plus he is supposed to NOT do anything but rest. Fortunately he is a good patient. It means extra work for me, but he is so worth it. I will try to post, but will not promise. He's my priority this coming week. Summer Smooches Promotion Ends on Monday the 30th. Occasions Mini Catalog ends on Monday the 30th. Retirement lists have been posted. - items are while supplies last. For my Miche fans, I have updated my Miche Blog with the latest photos and details for the May 2012 Releases. CLICK HERE to view. Two items that were included on the Retiring Accessories List are not actually retiring. We have updated the lists to remove these items. Because these items were included in error, the Paper Snips will not be offered at a discounted price. We apologize for any inconvenience this may have caused. Stampin' Up! just posted the full list of items that are retiring. Here's the LINK to the list Retired Accessories. Here's the LINK to the list of Retired Decor Elements. All retired items can be view with photos thru my Stampin' Up! Website. There are a number of items with discounted pricing too. Also don't forget to check out the Clearance Rack while you are on my website. Some really good deals. Get them before they are gone! The retired accessories and Definitely Decorative (including Décor Elements) lists are now available and won't stay around for long--these items are only available while supplies last! When you look at the retired accessories list, you'll note that all of our Stampin' Pads are listed. This is for two reasons: (1) Craft Stampin' Pads will now only be available in black and white; and (2) we are introducing a new Firm Foam pad in our Classic Stampin' Pads with the 2012-2013 annual catalog. In the coming weeks I will have more information for you about the change to our Stampin' Pads and other products. 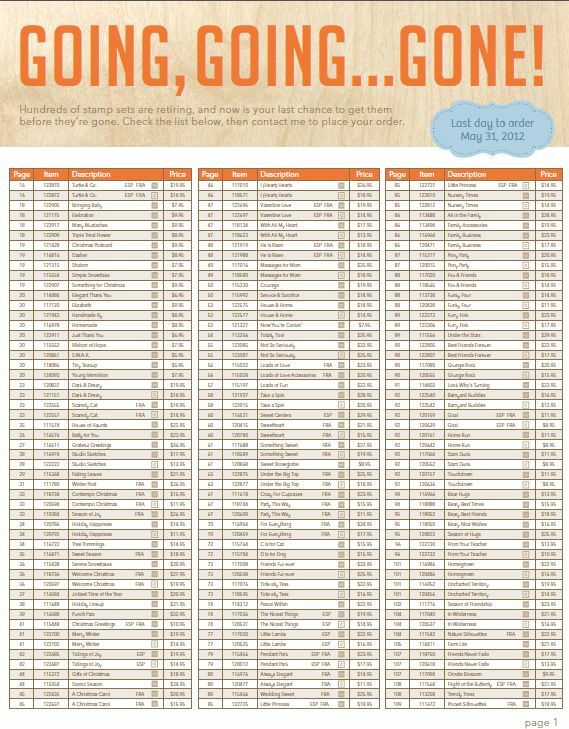 Today I just want to get the lists out to you so that you can order any product that you want/need. Remember these are while supplies last and many will sell out right away. Also please be sure to check names of ink if you are purchasing. Classic ink is what I typically use in my cards you see on my blog. Craft ink is thicker, takes longer to dry. White craft ink works great on darker card stock. 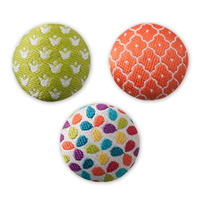 Three bold designs to coordinate with all of your sassy summer projects. Package includes 24 brads: eight each in three designs. Stampin' Up! let us know today that these are extremely limited. If you have been thinking about ordering these brads, I would highly recommend ordering now so you do not miss out. They will NOT be in the new catalog. "We're excited to announce that beginning 1 May, we're offering a fully customisable Starter Kit for new recruits at a new lower price of $99! This will give them the perfect start to their businesses--their way! It will also help you more easily share the Stampin' Up! opportunity with your customers. When a new demonstrator joins Stampin' Up!, the choice is hers to put together a kit with any of our current high-quality products--she can choose up to $125 worth of any Stampin' Up! products! She'll also receive a business supplies pack (valued at $65) to create a kit with a total value of $190 that still ships for FREE! With the introduction of the new Starter Kit, new demonstrators will no longer have the option to purchase another kit or the add-ons. If you have recruits who want to order the current kit option, they will need to place their order by 30 April 2012, 11:50 PM (MT)." If you have questions or would like more information, please let me know. It is a great time to join Stampin' Up!, and how wonderful to choose the items you want for your kit. If you would like the current kit option, you can go HERE, then click on Join Now on the left side. If you want the $99 kit option as of the May 1st ... you will go HERE then Join Now on the left side. On May 1st the link will be updated with the new kit info. The latest My Digital Studio downloads are HERE. I love the antique car that is in the latest downloads. Item #129873 - CLASSIC DAD GREETING CARD TEMPLATE. This specific download contains greeting card template, 6-piece stamp brush set. Click here to view the flyer (2 pages). Only a few days left of the Summer Smooches Promotion. Remember the fabric brads and the stencil will retire on the 30th. The rest of the items will be in the new catalog that premieres June 2012. It's been a busy past few days for me. I put my card making into high gear as we have a box of cards that is almost full. These cards are blank inside and each have an envelope. We have a US military unit that is currently deployed to Afghanistan that we ship to. This way they will have cards to send to their friends and families. Not all products used this time are from Stampin' Up!. The card bases, envelopes, stamp sets, and accent card stock are all Stampin' Up! products. The stickers and die-cuts are from other sources. When we send a box of cards, it typically contains 300 cards for many different types of occasions and thinking of you or note cards. Another thing we do is re-purpose cards ... taking off the card fronts of used cards in good condition, and then making them into new cards. We have also been fortunate to receive a number of brand new cards with envelopes (like you would buy at the store) to include in our shipments. There are four of us that get together almost every week. My heartfelt thanks goes to Maureen, Diane, and Joan for all that they do. Well, it's going to be a busy day for me. I have class prep work to do for Friday. Hope you all have a great day. Just a reminder that tomorrow (the 25th - Wednesday) Stampin' Up! will announce all products that will be retired. I will post the list as soon as I can. Remember these products are while supplies last only. When they are gone, no more will be re-ordered. You can also view the retired list by going to my website, click on SHOP NOW, then click on Retiring Products. Stamp sets that are retiring are already listed, but the other products will post on Wednesday. If you wait too long, you may miss out. Just had to share a new note cover I made that holds a pen. It will be a class project next week along with the petite purse. I will post a tutorial after my classes are complete. What is fun with these types of covers is that you can decorate them any way you want and in any color. They could easily be made for a male or a female by changing out the note pad and the card stock colors used. These pads are 3 1/2" x 7 1/2" and were found in the dollar bin at the store. I have seen them at numerous locations/different stores. Here's the 5 petite purses I made to share with you. You may view a larger image by clicking on the photos. This card stock is retired. But isn't the petite purse cute with the little owls. *NOTE: This die is available this month only. Cannot be purchased in May. 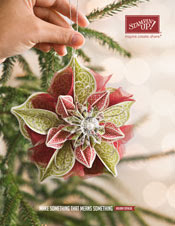 However, it will be back in our main catalog in June 2012. I think this die is absolutely perfect for a small gift item, for a birthday, a bridal shower, a wedding favor and so much more. I gave one as an Easter gift filled with wrapped lifesavers. You could be chocolate sqaures or individually wrapped chocolates in it. I'm working on some samples of the Petite Purse BigZ Die. Can't wait to share them with you on Friday. I've decorated each one a bit differently and am very pleased with the results. These purses are just so cute. Stampin' Up! published the retirement list in darker color ink making it so much easier to read. You can view it HERE. It is a 2 page pdf document. This list is of the retired stamp sets only. They will be available for order thru the end of May 2012. The other items (embellishments, DSP, etc) will be published on the 25th of April and will be available only while supplies last. 1. Using the Big Shot cut out the two tags in Whisper White. 2. Stamp 3 flower images on the Wisteria Wonder Card Stock and punch them out using the Blossom Punch. a. Punch out 3 solid Wisteria Wonder Blossom flowers. c. Attach a small pearl to the center of each. e. Set the other 2 flower aside for later. 3. Using Wisteria Wonder, punch out two 5 Petal Flowers. a. Layer/off-set the flowers using SNAIL or Mulitpurpose Glue. b. Attach a small pearl to the center. c. Crisply crease all your score lines on the card base. Do the 4 ¼” and 5 ½” creases first and lay card stock flat. ii. Then fold left to right. iii. This creates your two pockets. 5. Punch out the Dotted Scallop Ribbon Border using the 2” x 7” piece of Whisper White. a. Place SNAIL on top of the front crease, then place ribbon on top. 6. Attach the small piece of DSP across the bottom of the front of the card. 7. Attach the remaining two flowers to the front. 8. Slide in bookmark in the front pocket. 9. Slide in tag in the inside pocket. Last week I celebrated my 60th birthday!!! Not sure how I got to be this old, because I certainly don't feel it. We had a few friends over on Saturday night to help me celebrate. We had such a good time. The cake is from Saturday. It was so delicious. I love the rainbow on it. I think we all need LOTS of rainbows in our lives. I received many birthday cards too. A few were handmade. This photo is of the handmade ones I received. If you look closely you will see quite a bit of Stampin' Up! products that were used. Cake & ice cream over, time for a group photo. 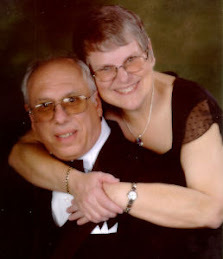 My wonderful husband (Hal) and me. Thank you to everyone for the wonderful birthday wishes via phone, e-mail and in person. It was a great birthday, and I know it will be a great year too. I am on Pinterest .... my boards are HERE if you would like to follow me there also. My blog is still the most complete choice with a greater amount of details and information. The latest My Digital Studio (MDS) downloads are available HERE. Hope everyone had a wonderful weekend. I just wanted to share two cards that I made. Quick and simple, yet a bit of elegance too. These were made using the Framelits - Label Collection for the Big Shot. Stampin' Up! just released the complete set of stamp sets to be retired. The list includes wood and clear sets. These sets will NO longer be available after the end of May. When you get to the retired list, it defaults to 8 images at a time. Look over to the right, there will be a drop down menu next to the wood SHOW, click on ALL. Now you can view all the stamps sets that are retiring at one time. This list is printable ... click on File Print. Remember that some stamps sets only come in WOOD mount version so if you have a mix of stamps, you might want to check the WOOD mount list. A 2nd retirement list will post on the 25th of April. That list will be of card stock, embellishments, etc and items will sell out quickly. This retirement list will be "while supplies last". Today I wanted to share three samples of cards I made using the Summer Smooches Promotional items that are currently available thru the end of the month. Don't miss out on these great products. The Summer Smooches Fabric Designer Brads and the Summer Smooches Decor Stencil will only be available during the month of April. They will NOT be in the new catalog. The brads are gorgeous!!! I pre-ordered them and was really pleased with them. It's perfect for a little girl's birthday party, a bridal shower, or even a Miche Bag party. I'm sure you can think of many more ideas. The one above is made with Wisteria Wonder Card Stock. This die will definitely get a lot of use. I am so glad I decided to purchase it. This purse was filled with lifesavers and given to our neighbor's little girl. She was thrilled with it. "Due to a supplier backorder, we are out of stock of item 103305, Dotto, and this item will be turned off in the US and Canada. As Dotto was scheduled to be retired at the end of May, we will not be able to obtain a resupply on this item; thus, any customers with existing backorders on this product will be contacted by Demonstrator Support and offered either a refund or exchange. We apologize for any inconvenience this may cause." Pear Pizzaz was used in the card base, ribbon, and classic ink. All will retire at the end of May 2012. Pleated ribbon will not be available after the end of April 2012. 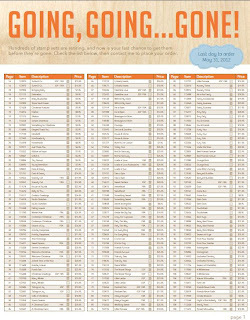 25 April - list of product that are retiring or being discontinued as of the end of May 2012. If an item you want is on the retirement lists, I highly recommend that you place your order for it as soon as possible. All items with the exception of stamp sets will be sold only while supplies last. Many, many items will sell out within hours of the list going active. I will post the information here as soon as I have it to post. I don't want any of you missing out on items that you want or need. This is a double pocket card (Thank You, Patty Bennett) for the idea. The choice of card stock and Designer Series Papers along with the decorations were my own design. I like the idea of cards that also have a gift purpose. On the front pocket the center flower is actually a bookmark that the receiver of the card can use. The inside tag is large enough for a note or stamped sentiment - the choice is yours. Directions for this style card will be posted next week. The latest My Digital Studio downloads have just been released. You may view them HERE. April 10, 2012 We have added 55 NEW Clearance Rack items to the Online Store, including a number of punches, dies, and accessories. Have fun shopping. These items can only be ordered thru on-line shopping. Don't miss out, there are some great deals ... while supplies last. This last week I needed to make some birthday invitations. Here's my final design. I was very pleased with the results, and they were fairly easy to make also. Basically I used LOTS of Stampin' Up! punches. The inside of the invitation, I created on my computer then printed. My printer handled the think card stock ... as long as I put it in the one page at a time tray. We have no idea what items will be in the new catalog that premieres June 1st. I can tell you for fact that even if the pleated ribbon is kept (fingers crossed) the Pear Pizzazz and Blushing Bride would not be offered. They are part of the In Color group of things that will retire as the end of May 2012. 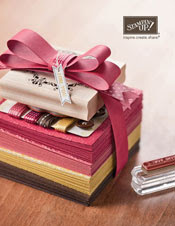 Also the Occasions Mini Catalog that the ribbon is currently in will end at the end of this month. So if you love the ribbon, be sure to put your orders in so you don't miss out. Here's two more examples of my black, white, and red all over cards. Easy to make and a great way too to use of smaller pieces of card stock. Another response to "What is black, white, and red all over? Funny the things we remember and how many smiles that brought to us all at the time.